The US has been in a serious decline in political and journalistic freedom since the introduction of the war on terrorism in 2001. Year after year, an increasingly greater number of freedoms are being curtailed in favour of a tightly controlled narrative. Each day we see new forms of censorship and the crushing of dissent. Many of us knew this was coming. People like me have been doing independent broadcasting (now known as citizen journalism) much to the chagrin of the powers-that-be. Don’t think so? Merely look around and see the censorship of dissident voices today. Anyone who disagrees with the mainstream narrative is dismissed as a Russian bot. All one has to do is oppose the war US war machine, or the Democratic Party. You’re free to bash the President all you wish (and with good reason) but take a step against the policies that are shared by both the Democrats and the Republicans and you’ve got yourself a bot label. Not too long ago the Russian state broadcaster RT America was forced to register as a foreign agent. This meant the programming and online news service had to let you know explicitly that they were “funded whole or in part by the Russian government.” As if this were some sort of mystery! I think everyone already knew that RT was funded by Russia. After all, they were known as Russia Today. This was the first time the state broadcaster of another country had to register as a foreign agent. Many countries are free to have such state broadcasting without such a label. Canada and the UK as an example. I suppose the rule is only arbitrarily applied to those whom the US is in serious disagreement with. However, in the last week, we’ve seen a serious expansion of this policy. 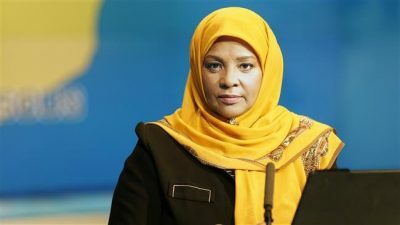 Press TV journalist and anchor, and US citizen, Marzieh Hashemi, was abducted by the US government. Just over a week ago the woman was snatched at the airport in St. Louis as she attempted to visit family – particularly her terminally ill brother. The grandmother of three was shackled, had her hijab ripped off and fed only pork in violation of her religious rights. She was held for 48 hours without any notification to her family. She suffered all of this mistreatment, and she isn’t even accused of a crime. Eventually, the FBI publicly announced that she was being detained as a material witness in an investigation. Not even accused of a crime! The purpose of her testimony? To determine if the Iranian state English language broadcaster, Press TV, was a propaganda outlet. That’s what they wanted her abducted and forced to testify for. So all of these rights she has as a US citizen have been violated because the US government wants to demonize Press TV? Is this not an attack on freedom of speech? Or does it not count because Press TV is not American? After all, is not Press TV, who is not located in the US, nor do they do any business in the US applicable to US law? Where does the US get any legal jurisdiction to take such an act? RT America has a US office and US employees, and is available on US television services – so maybe you can make that kind accusation. However, Press TV isn’t available in America, unless you go online to their website. What jurisdiction does the US government have to enforce labelling like this on a non-US entity? What is this nonsense? Can any state simply attack a foreign broadcaster this way? Can I as a Canadian simply demand that some obscure African TV station which doesn’t broadcast in Canada register as a foreign agent? Certainly not. Hashemi isn’t just a journalist and anchor for Press TV. She has also had a big hand in the human rights struggle for American Blacks for several decades. Most notably she has been highly involved in the Black Lives Matter protests. She’s been the author of documentaries cataloging the struggles of Black Americans against racist police killings. She’s been a voice for the voiceless on the issue of Israeli genocide against Palestinians. She’s been a voice against US imperialism around the globe. She’s a respected journalist in this regard! Her illegal detention and mistreatment is nothing less than an act of terrorism against dissenting opinion. What threat does this grandmother pose to the US public? None. Only the idea that American Blacks have rights as human beings as well. What threat is RT America, or Press TV? The fact that these broadcasters dare criticize US foreign policy? Have they committed the unholy crime of disagreeing with the US ruling establishment? This is nothing less than an attack on freedom of speech – an attack on the right of a free press to hold those in power accountable for their actions. We should see this for what it is, terrorism against dissenting opinion and opposition to US crimes.